When planning my Thanksgiving dessert table, I like to add hand pies as a nice way to change up the choices. 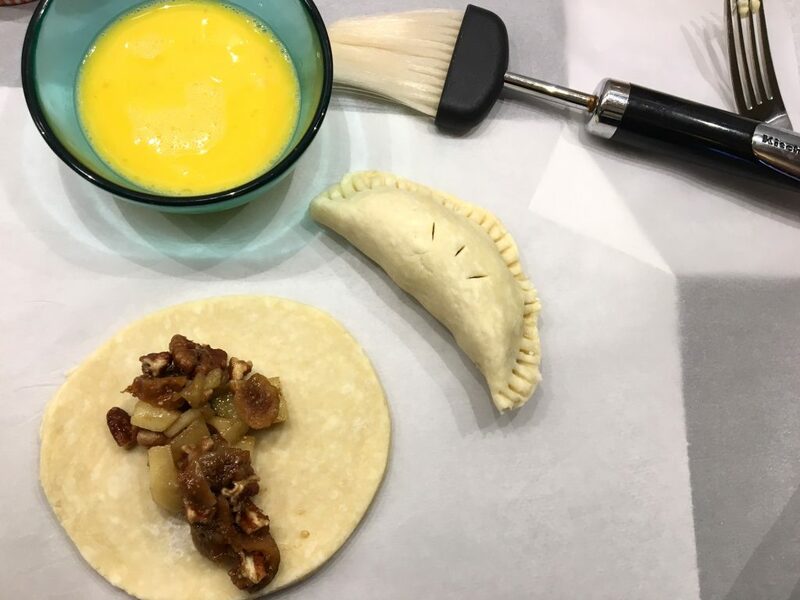 Slices of pie are required of course, but when you have a crowd, hand pies offer a great alternative without the fuss of cutting and plating. If you love crust, these are for you. Crust is the star here, so make sure you use all butter. Presentation points. They are adorable, people love getting these as gifts or seeing them on the table. You can make them ahead of time. They get better the next day. You can eat them right away too. You can bake these and eat them quickly because they cool faster than a whole pie. There is no downside to pie you can eat with your hands. There is some planning involved, but there are steps you can do in advance that will make it easier. Assembly. Don’t fear the assembly – hand made things are all the rage. You might eat too many. Is this really a reason not to make them? Your friends will ask you to make them again. My favorite hand pie recipe is Caramel Pecan Hand Pies and you can head over to the blog post for the recipe. They are my most requested pie and incredibly good. 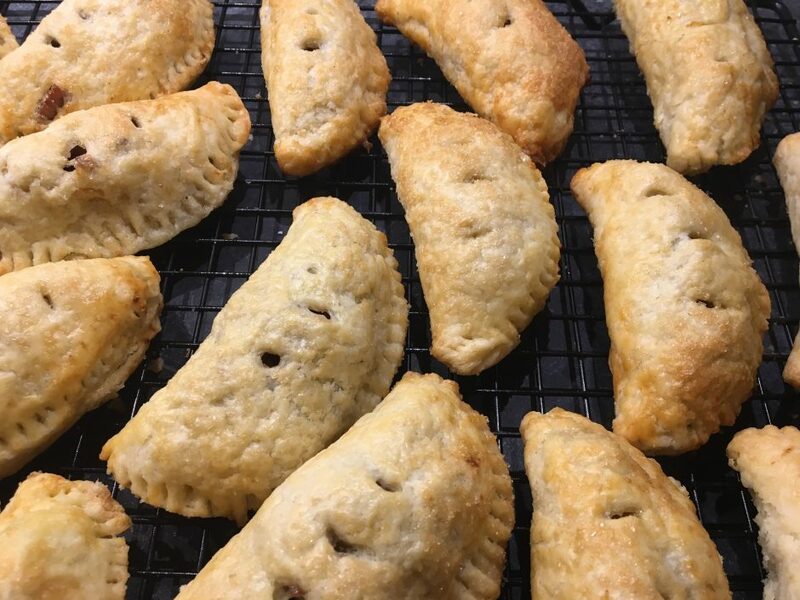 These apple, fig and pecan hand pies are another great option. They are just different enough to get your attention but feel like Thanksgiving. But here’s the thing – you can put anything in a hand pie! Make the circles then play around with whatever you want. You can keep it super simple by tossing some apple slices with sugar and cinnamon and calling it a day. You can’t go wrong wrapping anything up in pie crust. Prepare pie dough and refrigerate for at least 30 minutes. Once chilled, roll out pie dough. Using a three inch circle cutter or glass, cut out as many circles as possible. I can usually get anywhere from 18 to 20. You will have to re-roll the dough a couple of times, so if it begins to get too warm, place it back in the refrigerator for a few minutes. Place circles on a parchment-lined baking sheet and keep in the refrigerator while you make your filling. Peel and dice apples, placing them in a deep skillet or large pot. I like to use my enamel dutch oven. 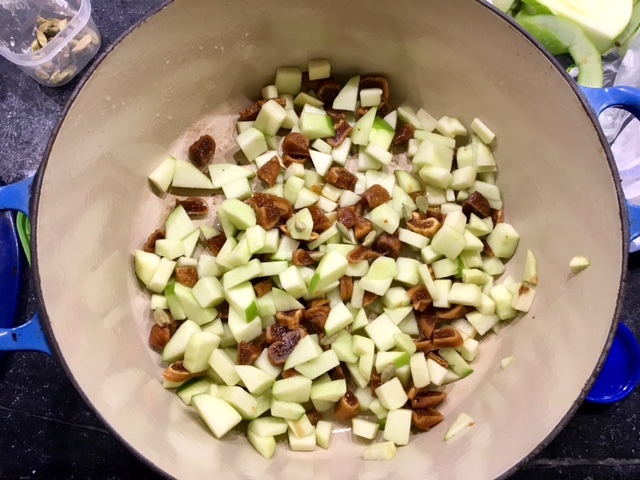 The apples should be diced on the larger side, cutting a slice into thirds. Chop the figs and add to the apples. Add lemon zest, lemon juice and the honey. Over medium heat, begin to cook the mixture down. While the mixture is cooking, toast pecans in the preheated oven. In a small bowl, combine 2T sugar, cardamom, cinnamon and corn starch. When the apples are just starting to soften, increase heat to medium-high and add the cornstarch mixture. Cook for about 1 minute until the juices begin to thicken. Turn out into a bowl to cool and fold in pecans. You can prepare the mixture a day before and store in a air tight container in the refrigerator. Remove dough circles from the refrigerator and let them sit for a couple of minutes before starting to assemble. If they are very cold, they are more likely to crack when you fold them. Prepare an egg wash by mixing one egg and about 1 tablespoon of milk in a small bowl. Take one dough circle and place about 3 tablespoons of filling in the middle. You can experiment with as much as you can fit in. Fold the circle, bringing the edges together. Using a fork, press the edges so that they have a good seal. 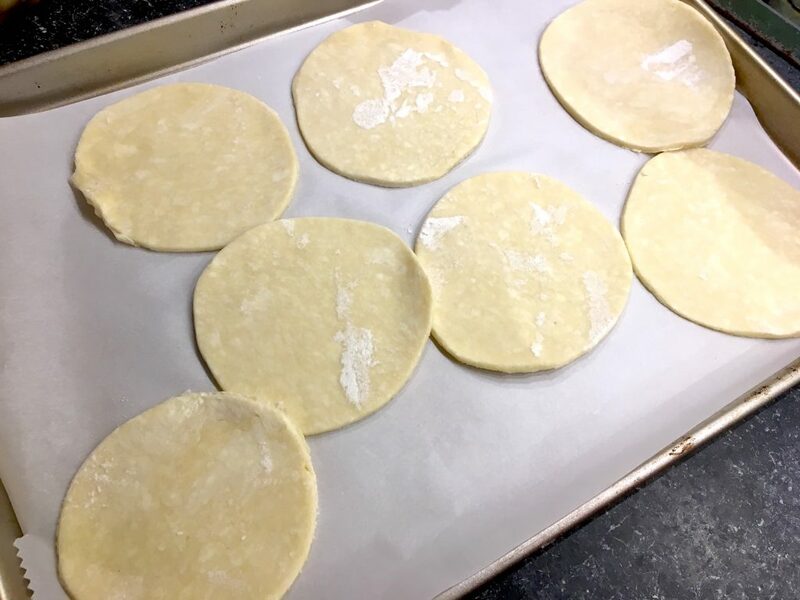 Place on a parchment-lined baking sheet and continue with the rest of the circles. 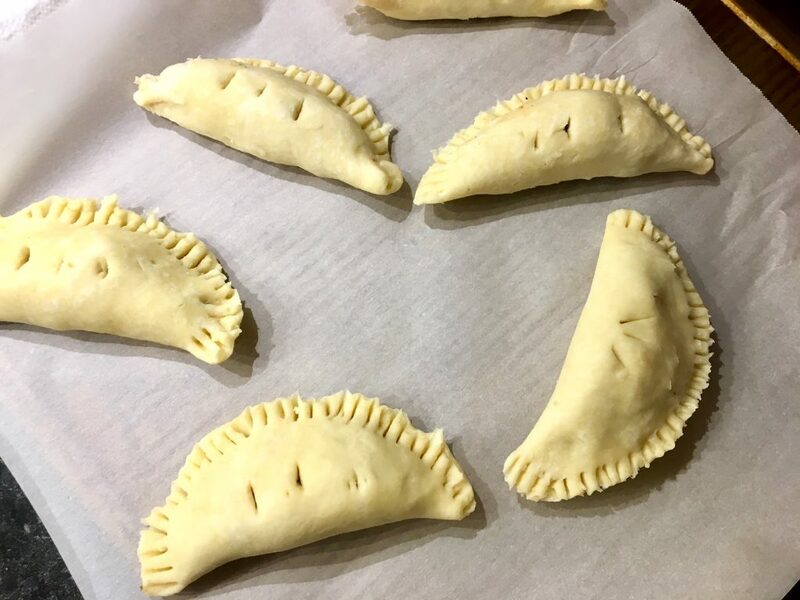 Return hand pies to the refrigerator for about 5-10 minutes. You can put half of them in the refrigerator while you finish the second half to get ahead of the game on this. When the hand pies have firmed up a bit in the refrigerator, use a knife to cut decorative vents in the top. Brush with egg wash and sprinkle lightly with turbinado sugar or regular granulated sugar. Bake for 30-35 minutes until golden brown then place on a rack to cool completely. These taste even better the next day once the flavors have come together. Enjoy!